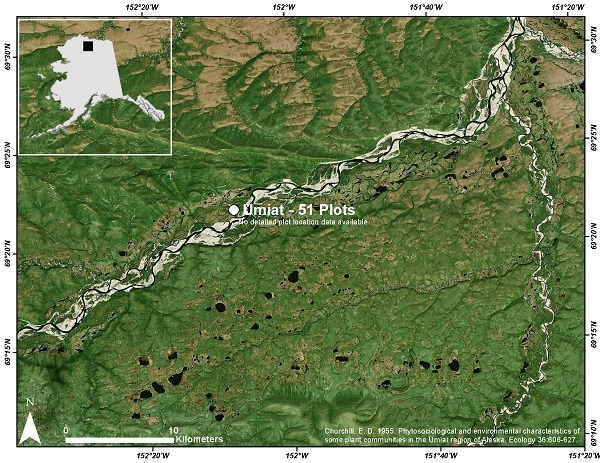 This data set provides vegetation cover and plot data collected during the periods of July and August, 1951, from 51 stands (areas of homogeneous vegetation communities) in the the Umiat region of Alaska, on the Colville River. The Umiat area is within the Northern Foothills section of the Arctic Foothills province on the slope north of the Brooks Range. Data include vegetation species, percent cover classes, soil moisture, topographic position, slope, aspect, and plot shape and size. The study plots were subjectively located in plant communities that occurred in six broad habitat types. A modified Hult-Sernander scale was used to determine the vegetation percent cover classes. The data are provided according to the original source (Churchill, 1955) and also according to the listings provided in TURBOVEG, a database for managing vegetation-plot data (see http://www.synbiosys.alterra.nl/turboveg/). Figure 1. Vegetation plot at Umiat, North Slope, Alaska, 1951 (from Churchill, 1955). This data set provides vegetation cover and plot data collected in 1955 from the Umiat region of Alaska. Early vegetation sampling on Alaska's North Slope was undertaken by Ethan D. Churchill while stationed at Umiat on the Colville River. 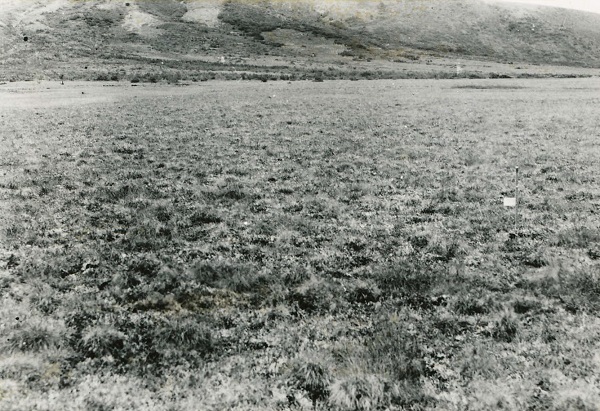 Field work was conducted in July and August of 1951 to identify plant communities and to determine their relationship to environmental conditions. Vegetation species are listed and percent cover classes are provided according to a modified Hult-Sernander scale. Plot data includes moisture, topographic position, slope, aspect, shape, and size. The data are provided according to the original source (Churchill, 1955) and also according to the listings provided in TURBOVEG, a database for managing vegetation-plot data (see http://www.synbiosys.alterra.nl/turboveg/). There are two data files with this data set in comma-separated (.csv) format. The files provide the vegetation species found at 51 plots as well as the percent ground cover occupied by the species and plot data. These data may also be found in the TURBOVEG database. The files include the TURBOVEG accession numbers as well as the original plot nomenclature and numbering. There are also three companion files which provide plot photos and research information. Umiat_Species_Data.csv The estimated percent land cover by species per plot according to a modified Hult-Sernander scale. The plots are named according to the original stand numbers and the TURBOVEG accession numbers. Example data are provided in Table 4 below. Note: In five instances, taxa were lumped into a single taxon in the PASL: 1) Carex bigelowii s. ensifolia (Carex consimili and Carex lugens), 2) Equisetum arvense s. alpestre (Equisetum arvense var. boreale and Equisetum arvense var. boreale f. pseudo-varium), 3) Salix niphoclada (Salix brachycarpa var. mexiae and Salix niphoclada), 4) Salix glauca s. acutifolia (Salix desertorum, Salix glauca var. acutifolia, Salix glauca var alisceae), and 5) Salix pulchra (Salix pulchra and Salix pulchra var. palmeri). These data represent a historical snapshot of conditions on the North Slope in the mid-20th century. They could be useful for studies of vegetation and land cover change and also for climate models. Stands were not permanently marked and very little plot-specific environmental data were recorded. 1) A verbal description of aspect was converted to degrees and then crosswalk to TURBOVEG categorical data. Where slope was 0 and aspect was lacking, aspect values were converted to -1 “too flat to determine”. 6 (covers 3/4 to 4/4 or 87 percent). 3) The pluses and minuses associated with cover values as presented in the publication were dropped (although not where plus alone indicates a trace) as these symbols were not assigned a value. 4) Habitat types and site moisture were assigned by D.A. ‘Skip’ Walker in January 2016. 5) Location data were not available for the plots so all were assigned the latitude and longitude for Umiat. The Umiat area is within the Northern Foothills section of the Arctic Foothills province on the slope north of the Brooks Range. The general topography of the upland is gently rolling hills and moderately flat valleys. The climate of the Umiat area is rigorous. The average annual temperature is 10.7 degrees F; the lowest recorded temperature was -63 degrees during February, the highest was 85 degrees during July, and the mean monthly temperature was below 0 degrees for the period December through April (Churchill, 1955). The tundra vegetation of the Umiat area displays in many cases variation within a few feet or inches, probably as a result of the variation in environmental conditions accompanying a few inches difference in microrelief and resulting in a mosaic of microstands. Each stand has a homogeneity of micromosaics that is distinctive over a given area and is dissimilar to the distinctive homnogeneities of adjacent area. The elevation on the floodplain at Umiat is approximately 340 feet. Elevations of the ridges and tops of hills of the upland extend to 950 feet (Churchill, 1955). Figure 2. Aerial view of the river and floodplain at Umiat, Alaska. Early vegetation sampling on Alaska's North Slope was undertaken by Ethan D. Churchill while stationed at Umiat on the Colville River. Field work was conducted in July and August of 1951 to identify plant communities and to determine their relationship to environmental conditions. 6 (covers 3/4 to 4/4). 5) Alder communities (2 plots), and 6) Sedge grass and dwarf shrub mire and fen vegetation (3 plots) (Churchill, 1955). Plot characterization data are also included with this data set. However, location data were not available for the plots so all were assigned the latitude and longitude for Umiat. Churchill (1955), references Payne et al. (1951), Smith and Mertie (1930), Stenfansson and Whittington (1947), and Black and Barksdale (1948) regarding the geology and topography of the area. Habitat types and site moisture were assigned by the primary contact D. A. ‘Skip’ Walker, in January 2016. Black, R. F., and W. L. Barksdale. 1948. Terrain and permafrost, Umiat Area, Alaska. Progress Report No. 5, Military Geology Section, U. S. Geol. Surv. Washington. 23 p.
Payne, T. G., W.W. Dana, W. A. Fischer, George Gryc, E.H. Lathram, R.H. Morris, H.N. Tappan, and S.T. Yusler. 1951. Geology of the Arctic Slope of Alaska. Oil and Gas Investigations, Map 126 Sheet 1. U. S. Geol. Surv., Washington. Smith, P. S., and J. B. Mertie, Jr. 1930. Geology and mineral resources of northwestern Alaska. U. S. Geol. Surv. Bull. 815. 351 p.
Stenfansson, K., and C. L. Whittington. 1947. Stratigraphy and structure of the Umiat anticline. Report No. 3, Geological Investigations Naval Pet. Res. No. 4, Alaska. U. S. Geol. Surv. Washington. 11 p.